Serena Williams hugs Venus Williams after losing to her sister at the BNP Paribas Open on Monday, March 12, 2018, in Indian Wells, California. Venus Williams won 6-3, 6-4. One sister is rusty, just beginning a comeback after having a baby. The other is rejuvenated at 37, back in the world's top 10. An unwanted rivalry with roots going back 20 years had its latest chapter Monday night at the BNP Paribas Open, with Venus Williams beating sister Serena 6-3, 6-4 in the third round for her first win over her younger sibling since 2014. It was their earliest meeting since a 17-year-old Venus beat 16-year-old Serena in the second round of the 1998 Australian Open. They played Monday night for the first time since last year's Australian Open final, when a pregnant Serena won her 23rd Grand Slam title. "That's going to be a huge story, maybe the story of the year," men's No. 1 Roger Federer said of Serena's comeback. "Hopefully, she decides to play a lot and enjoy herself in the process and get back to who knows how high? It almost doesn't matter, but it would just be amazing to see her do it now." But this night belonged to Aunt Venus. She closed out the 1 ½-hour match on her second match point when Serena's forehand service return sailed long. It was one of Serena's 41 unforced errors, including 17 on the forehand side. "I'm just lucky that I've played more matches than her right now," Venus said on court afterward. "She just came roaring back. I had chances for the match to be over, but it wasn't." Venus broke Serena at love in the sixth game for a 4-2 lead in the first set. She emphatically closed out the 36-minute set with back-to-back aces that clocked 108 mph and 120 mph. 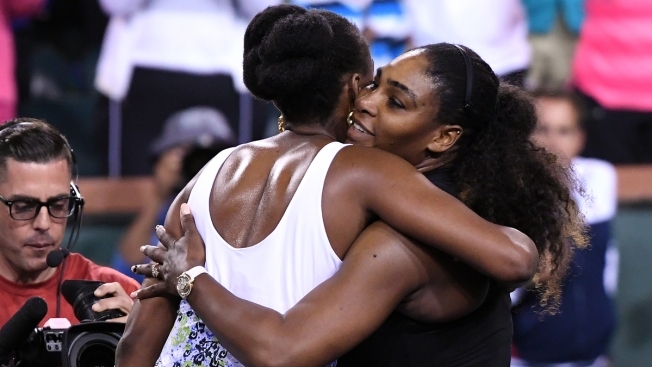 "I definitely know her well, but she definitely played a little bit better than she normally does," Serena said. "She served very consistently. She just did everything great." Venus raced out to leads of 3-0 and 5-2 in the second set. Serena's shot went wide to set up her sister's first match point. But Serena cracked a backhand winner down the line for deuce. Venus' forehand was long and she double-faulted away the game to make it 5-3. Venus faced two break points in the next game, but got bailed out on Serena's consecutive forehand errors to get to deuce. Venus hung on from there to end their 29th meeting. "Missing shots that I never miss, and so close," Serena said. "At least they're in the margin. I'm getting there. It's not exactly where I want to be, but I'll get there eventually." Serena still owns a 17-12 advantage overall, although Venus evened their WTA Tour head-to-head meetings at 7-7. "I really abhor every time we play, but I do enjoy the battle when I'm out there," Serena said last weekend. "It's just afterwards I don't like it as much." It was obvious at the net when they greeted each other with a one-arm hug and neither smiled. Venus did her usual victory pirouette, but still didn't smile. A stone-faced Serena exited the court to cheers, pointing her right index finger in the air. Serena was back on the WTA Tour for the first time since ending a 14-month absence during which she gave birth to daughter Alexis Jr. and married Reddit co-founder Alexis Ohanian, who sat courtside. "It's good that I don't have to say that this is the best tennis I have ever played and I lost," Serena said. "My room for improvement is incredible." Typically, the sisters wouldn't meet until the later rounds of a tournament. But 36-year-old Serena was unseeded in this event. Venus is seeded eighth. Serena won her first two matches, while Venus received a first-round bye and won her opening match. "I think she's going to be speeding back to the seedings and to winning tournaments sooner than later," Venus said. The Indian Wells match was 17 years in the making. The sisters were supposed to play each other in the desert in 2001. A packed stadium awaited their semifinal but shortly before the match was to begin Venus withdrew with a right knee injury. Serena went on to play Kim Clijsters in the final. Venus and her father Richard were greeted with boos as they made their way to their seats, with some fans believing Richard had been behind Venus' withdrawal. Richard Williams said he heard racial slurs from the crowd and he paused to shake his fist at them. Serena was booed throughout the final before she beat Clijsters in three sets for her second title in the desert. After that, the sisters boycotted Indian Wells for 14 years. Serena came back in 2015 only to withdraw with a knee injury before her semifinal, and Venus followed the next year. "It never crossed my mind," Venus said.